By 1992 ZX Spectrum was well on the way out in the rest of the world. But in the former Soviet countries, it was the Hot New Thing, because a clone of it could be made by a skilled electronics enthusiast from available components in his garage cheaply, which was an important consideration for a country where $100 was considered a dangerous sum of cash to keep at home. Of course, we did not get our games from any kind of store back then. The legal software was available only in a few places and cost way too much. Instead, to get something to play, you would go to “radio market”, which was a typical flea market, specializing in electronics and software. It was the best of the times, it was the worst of the times: you would browse stacks of audio cassettes, yes, the kind you would put in Sony Walkman, filled with games and programs instead of music. Sometimes there were labels, sometimes the contents were misprinted, and sometimes there was no label at all, just the name of a compilation, like “Best ZX Games #12”. But any tape cost around $1 and usually contained 10-15 pieces of software, so you were bound to find at least something interesting on it. Floppy disks appeared on the market later, and I didn’t get access to this advanced technology for a few more years. 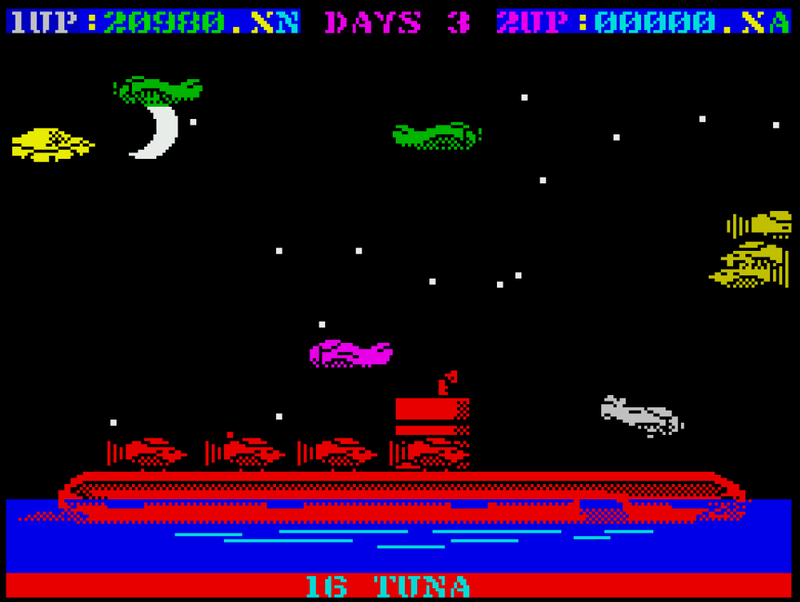 As a child, I had many favorite ZX Spectrum games, some of them relatively well-known even to this day, like Saboteur, Dizzy or Elite, others a bit more niche, like Night Gunner and Island of Dr. Destructo. The last name holds a special place in my heart, despite being a very budget title from Mastertronic, a low-cost games publisher. It had somewhat clunky controls and graphics that weren’t top-notch even for ZX Spectrum, but there was a key feature that made the shortcomings of the game irrelevant: fully destructible levels. Few games allow the piece-by-piece destruction of level elements even now. Of course, Worms series (and its long-ago predecessor Scorched Earth) allow you to blast the terrain to bits, and you can probably include block-based games like Minecraft or Terraria and their clones in the list. The Island of Dr. Destructo was a different game still: unlike the others, the destruction of the level was the goal, not just a side-effect. Each level of Destructo (as the game is also known) is a single big structure, a capital ship, an island or even a castle. The player needs to destroy it by punching enough holes to sink it (it’s obvious that the game was originally designed with only the ships in mind, but later when the different objects were added, there were no resources to replace the fountains of water spouting from the breaches with anything else). Since the player controls a single fighter plane armed with only a machine gun, he can’t do it directly. 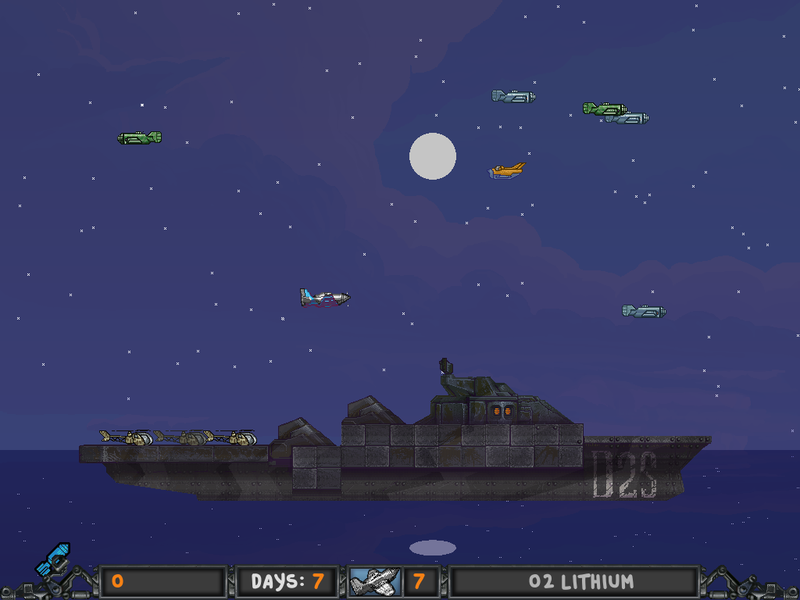 Thankfully, the enemy provides the player with the instruments of his own demise: an army of various aircraft, from slow-moving prop planes to UFO and hyper-jets. The player can shoot them down, and the wrecks of destroyed baddies will fall down on the level’s target and blow chunks out of it, thereby bringing it closer to sinking. The last time I turned on my Spectrum was, I think, somewhere around the year 2000 or so, and I even only ran the emulator on my PC a few times since then. But the gameplay of Island of Dr. Destructo was stuck deeply in my memory. So when I was between pet projects, having abandoned yet another half-finished idea, I decided to make something simple and quick. Like a remake of a game I love. That’s how Return of Dr. Destructo was born. 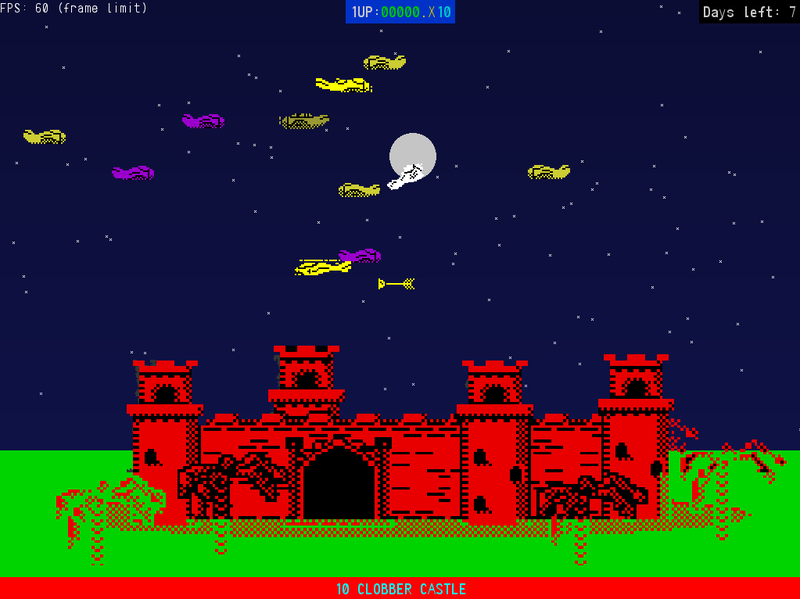 The initial programming and extraction of resources from the original ZX Spectrum game took about six months, working evenings and on weekends when I had free time. I kept myself motivated by setting milestones for myself and keeping a day-by-day progress file in the meantime. Then came the hard part: I wanted to replace the game’s graphics with something more modern, but I couldn’t draw a well-looking sprite to save my life. So I started a long hunt for an artist. At first, I tried to find someone to work for free, because I had no intention of releasing the game commercially, but it soon became apparent that it’s nearly impossible to find anyone skilled who wished to donate his time to a free open-source project. In the end, Oleg Pavlov did such an excellent job on the graphics, that while I kept the desktop release free and open-source, as originally intended, I also decided to take a chance and make a commercial mobile version of the game (you can download Windows, Linux, and MacOS X versions from the project’s original page, and there is a link to the source code there). To this day, the main gameplay remains largely unchanged from the 1987 original. However, I introduced a few improvements. One is a more fine control of the player’s plane with support for keyboard, touch controls (in mobile version) and gamepads (somewhat limited on Linux/MacOS X, because you won’t believe what kind of a pain handling gamepad on multiple OSes is). But the main one is the pixel-perfect destruction of level’s target. ZX Spectrum’s version was limited by the platform’s abilities to only allow block by rectangular block destruction, but in Return of Dr. Destructo, explosions can be of different sizes, and each one destroys a roughly circular piece of the ship with jagged edges. Another innovation is the introduction of six different planes and their super-weapons. The original game only had a bomb you could drop once per level, which produced the same effect as a single enemy’s wreck, but now even that bomb is different (producing several explosions instead of one) and the other planes have even more interesting abilities, like time freeze, for example, which were quite fun to code! And last, but not least, unlike the original game, you can now play in Story Mode, which allows you to continue the game from any level you have already reached, instead of restarting it from the first one each time. However, if you prefer a harder challenge, you can always play Marathon mode, which always starts from the beginning. 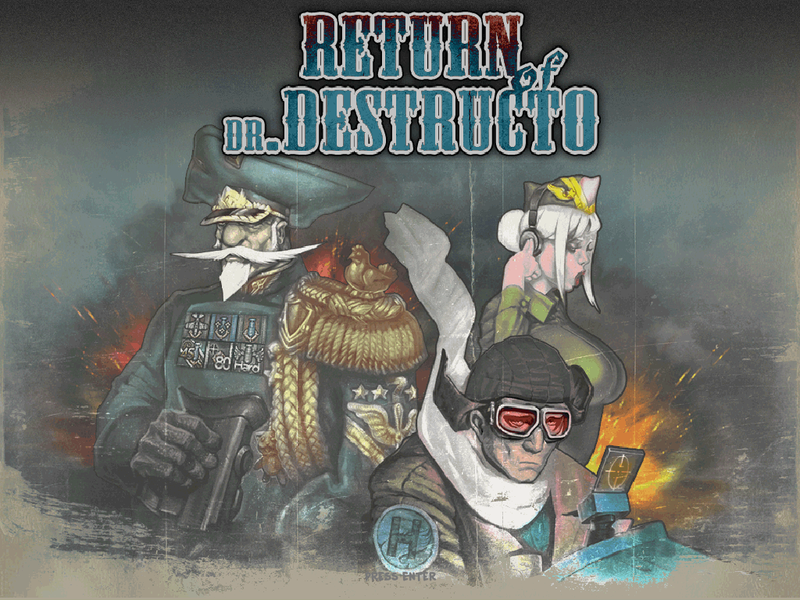 I think that the Return of Dr. Destructo’s gameplay stands out a little even in today’s oversaturated arcade market, so I hope you try it and like it. It’s currently available from Google Play for Android phones, and while it contains some in-app purchases, they are strictly unnecessary for finishing the game, and don’t affect the difficulty of levels, which closely matches the original (i.e. they are quite challenging, but could be completed with application of sufficient skill, as already demonstrated by some Chinese players, according to my statistics 🙂 ). My current employer, Lextre, helped me finish the mobile version by allowing me to work on it at the office and providing me with the services of our QA and a set of test devices, which helped me to hunt down a lot of device-specific bugs, of which there are plenty with Android. The members of Allegro developer community were very helpful, and I’d like to thank everyone involved in the development of this great library. Pablo Pastore provided important feedback and debugging information which allowed me to fix a dangerous error after the release of the first version of the game. Now that was an awesome article by Max Savenkov! This article was Published by Edamame Reviews, Written by Max Savenkov.